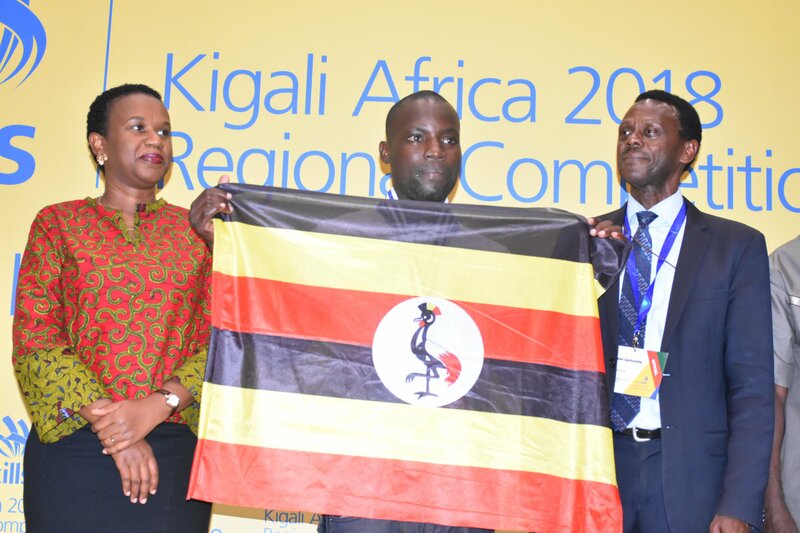 WorldSkills Kigali Africa 2018, were the first continental regional Competition in Africa! These competition brought together young skilled professionals to perform and show off their level of skills in an intensive competition in seven areas of their expertise which include Welding, Brick Laying, Electrical Wiring, Hairdressing, Cooking, Mechatronics and Plumbing. According to WorldSkills, the competitors were selected as experts with a criteria of being “best of the best” skilled personnel in their colleges or countries”. Six Countries participated and they include; Ghana, Kenya, Liberia, Morocco, Uganda and Rwanda. Before the Competition started, all Experts with their Professional Trainers from the participating countries attended an assessment workshop conducted by the WorldSkills Experts from South Africa and Sweden. For Julius’ case, Mr. Jeremy Yan, Head of Marketing and Sales at Sunmaker Oil and Gas Training Institute accompanied him as his Professional Trainer. Upon the competitions, Julius Ssekabiito warn a silver medal and came out as number two in the area of Welding. According to Julius, this was a dream come true unexpectedly although he had skills. “I had been trained in 1G, 2G and 3G Welding Skills, my competitors had been trained up to 6 G Level, so I call this a miracle to overcome them”, _said Julius. Upon returning to home in Uganda from Rwanda, Julius asserted that he was thankful that Sunmaker trained him in skills that are rare to be found with anyone in the country. In one of the exclusive interviews, he emphasized that Sunmaker is the only legitimate institute offering practical skills in International Welding, which has helped to train youths for skilled Jobs. · He is one of the 30 students of the International Welder’s Certification Program fully funded by CNOOC Uganda Limited at Sunmaker Oil and Gas Training Institute. · During the International Welder’s Certification Program Course that took place for 3 months from July to September 2018, Julius came out among the top best 5. · He is not talkative! However, he is very serious, committed and brilliant on his Welding Career. He has a dream of becoming one of the top best recognized welders in Uganda.